It is likely that most common answer to the question “What is the main benefit of flat washers or flange head nuts and bolts?” would be that the increased bearing area they provide distributes the bolt load over a greater area thus decreasing the potential for compressive yield. While true, during testing we were able to get visual evidence of two important conditions that go against many people’s assumptions. In support of a paper on the calculation of pressure cone angle originally written for presentation at the annual meeting of ASTM F16.96 Bolting Technology Subcommittee, we took scans of under head pressure for various fastener styles. While the entire study was rewritten in an article posted to the In the News section of our website, two findings related to under head pressure are extracted here because they likely have the widest reader interest. 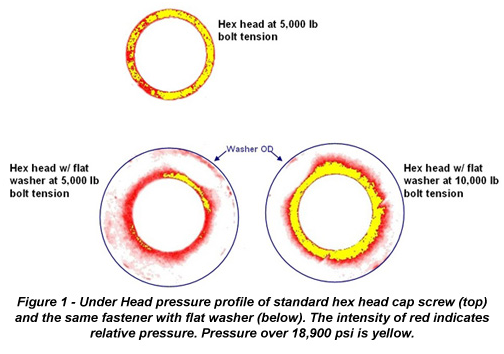 First, the standard flat washer, whether to SAE, ASTM or DIN standards, does not reduce peak stress anywhere rear what would be expected if it were assumed that stress reduction simply correlated to change in contact area compared to the bolt alone. Figure 1 shows the under head pressure profile for the common hex cap screw and the same fastener with a hardened flat washer placed beneath it. The profile was taken by scanning and digitizing Fuji Prescale film which had been placed under the head and nut. The fasteners were 1/2” -13 and directly tensioned in a load frame. The 5,000 and 10,000 lb loads represent about 40% and 80% the proof load of a Grade 5 fastener. While the precise reduction in peak pressure attained thru use the washer can’t be determined because portions of the film were saturated by loading it beyond it’s capacity, it likely about 30% at 5,000 lb and 50% at 10,000 lb. Based strictly on relative area, the stress reduction should be nearly 80%. While the fact that the standard flat washer is not thick enough to take full advantage of its diameter is likely not news to some readers, some likely haven’t really given the subject much thought and would be interested in seeing it. It also begs the question why consideration isn’t given to revising flat washer standards to decrease the relative dimensions of diameter and thickness. The other finding we thought would be of wide interest was the performance of flange head fasteners. While their OD is similar to that of a flat washer, the tapering flange thickness will in theory provide greater load distribution out to the OD. Figure 2 shows the results of testing flange fasteners in the same manner as the flat washers shown in Figure 1. In this case the pressure distribution under both the head and nut is shown because the results were marked different. One can see that under head contact was at the edge of the clearance hole, while the nut contact was at the flange OD. This is not the intent of governing standards, but rather the individual geometry of the fasteners chosen for test. 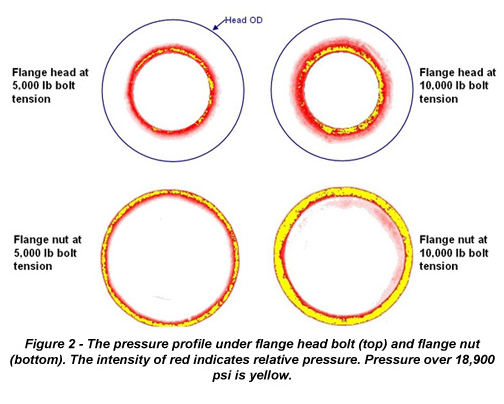 A survey of six different flange bolts and nuts in our lab at the time revealed that two contacted on the OD as in Figure 2, two contacted from the OD in to about half the distance to the clearance hole, and the last two contact over essentially the entire face. So these test results shown that contact areas can be smaller than expected when using flanged fasteners, again resulting in higher contact stress and greater potential for compressive yield. However in this case the size and shape of that contact area is more unpredictable. This condition influences more than contact pressure. One of the resisting moments that determine how much bolt tension is generated for a given input torque during tightening increases as the radius of the contact area increases. That is, the further the contact area is from the centerline of the rotated fastener, the more resistance is created during tightening, and the less bolt tension will be created for a given installation torque. The difference between the ID and OD contact shown in Figure 2 could reduce tension by about 10-15%.